First thing you must get is a Range mod, something which tells you how far away the target is. The Whale Shark is so big it's almost impossible to guess. I used RangeFinder from Curse, this is crude, but it works. Next you need patience, I tried searching for that but got bored and annoyed so I stopped. The Whale Shark swims very slowly, you can outrun him by swimming backwards (can you see where this is going?) You must stay between 5 and 20 Yards away. If he hits you, he will 1-shot you! I think on my first attempt he hit me for about 500k. Okay, what you need to basically do is, pull him, keep him between 5 and 20 yards and DPS. 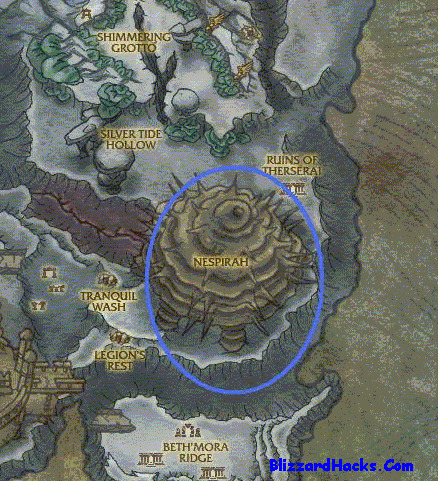 I kept Nespirah to the side of me and used it as a reference for turning. Be very careful with turning, he will catch up if you turn too sharp. This will be a long fight, it took me 20 minutes but my gear isn't amazing. I kept spamming Scorch (obviously while moving with talents) Living Bomb, Flame Orb, Fireblast, Hot Streak and Time-Warp. I averaged 7k DPS for this fight, like I said my gear isn't amazing, but it proves it can be done. The only reason to stay away from the surface is because it screwed my camera up!